It’s official. Wiki even has an article on it (2008 War in South Ossetia). It’s quite balanced and always updated, so I recommend reading it over any news source. He completely lost the information war. Georgia broke a ceasefire and invaded. Tick. Russia made an appeal to the UN (where it was struck down by Britain and the US, predictably enough), thus passing itself off as a peace-loving country forced to defend its Ossetian compatriots (90%+ of them have Russian passports) from the imperialist West and its Caucasian stooge. Tick. Even normally Russophobic media outlets, from what I’ve seen, cannot quite manage to spin this in an anti-Russian way (although I may have to retract this point, when the Op-Ed’s have been written up). Tick. The end result is that Georgia is seen as a treacherous, war-mongering aggressor even by Westerners. Consequently, any overt NATO or even American intervention is at least currently out of the question (barring a huge neocon sponsored media storm – but somehow I don’t think it likely). (To the contrary, as Georgia has attacked and killed Russian peace-keepers, this is a casus belli and as such the members of the CSTO will be obligated to come to Russia’s aid). And frankly, without that, Georgia is screwed. Georgia has militarized intensively since the Rose Revolution (military spending has been close to 10% of GDP), acquiring advanced precision and surveillance equipment and military training from the US and Israel. As such, this is more than enough to bring South Ossetia and Abkhazia back into the fold. But this is discounting Russia. 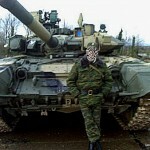 Apart from a few elite units, Georgia is a third-rate conscript army with Soviet third-generation equipment. Events are moving quickly. Even as I type this it increasingly looks as if Russia is beginning a concerted offensive against Georgian military targets and bringing in land forces to relieve Tskhinvali. (The wonders of modern communications technology). Anyway, it will sure be interesting today. A new Olympics. A new war. Perhaps a new pandemic? Ghost Recon begins in 2008, with civil unrest in Russia. Ultra-nationalists have seized power in Moscow, with plans to rebuild the Iron Curtain. Their first step is clandestine support of rebel factions in Georgia and the Baltic States. This is where the Ghosts come in: to silence the rebellion. Armed with some of the most advanced weaponry in the world, the soldiers of the Ghost Recon force are covertly inserted into Eastern Europe and given specific missions to curtail the rebel actions and overthrow their benefactors. The game’s storyline stems from political turmoil that came to light a few years earlier, in which the Ultra-nationalist regime came to power and placed its leader, Dmitri Arbatov, as Russia’s president. By 2007, the threat posed by the Arbatov Administration became clear. Russia forms an alliance called the Russian Democratic Union (RDU), which is made up of the previously conquered countries of Ukraine, Belarus, and Kazakhstan. Together, they launch a campaign to revive the long-dissolved Soviet Union by taking back all of the former Soviet republics. During the first few missions of the game, the Ghosts battle South Ossetian rebel forces from the north of Georgia, who are harassing the legitimate government and its allies. The Ghosts fight in the forests, on farms, and in villages while assisting their NATO allies in fighting the enemy. Unfortunately, the Russian government complains to the United Nations that the Americans have interfered in their affairs, and eventually they send in their army to aid the South Ossetian rebels. The U.S. cannot hope to stop the Russian Army from invading Georgia, so the Ghosts slow down the invading forces so that their allies can evacuate. Eventually, the Ghosts are all that’s left of the U.S. forces in Georgia, and they evacuate by SH-60 Seahawk helicopter on the rooftop of the American Embassy in T’bilisi, just barely avoiding the Russian forces. The Georgian government flees to Geneva and sets up a government-in-exile. Sadly, with the fall of Tbilisi, Georgia surrenders and is forcefully incorporated into the RDU. After Georgia falls, the Caucasus region is vulnerable to further attacks. The Georgian government, Great Britain, Germany, and the U.S. all protest the Russian invasion, but Moscow ignores this. Russia then focuses on invading the Baltic States on Lithuania, Latvia, and Estonia. In response to this, the Ghosts are sent behind enemy lines to find intelligence on the enemy attack. Unfortunately, the Russians launch their attack early and overrun the Baltic States within days. The Ghosts then are sent back in to slow the invasion down so NATO reinforcements can arrive from Germany. After cutting off the Russian reinforcements, the Ghosts fight alongside American forces to push the Russian Army out of the Baltics. Victories are won within the next months in Utena and Rezekne, and finally, NATO reaches Vilnius, Lithuania. The city was almost leveled after the invasion, but it is eventually liberated with some help from the Ghosts, forcing the Russian Army to abandon the invasion. The loss of the Baltic states takes its toll on Russia. President Arbatov is blamed for the disaster and placed under house arrest, starting rumors about a coup de’tat. The Ghosts then run into Russia to free American and Russian POWs opposed to the government. Some time later, President Arbatov is executed. This sparks a rebellion all across Russia that borderlines on civil war. The Ultra-nationalists quickly lose the support of the people, and many members of the RDU are also liberated or quit the alliance. The Ghosts are then sent on a campaign to disable the combat capabilities of several Ultra-nationalist military bases, such as the naval base at Murmansk and the airbase at Arkhangel’sk. They destroy several subs and prototype aircraft, making Russian Forces combat ineffective in Naval and Air warfare. While the Ghosts are striking bases, the Ultra-nationalists engage in battle with American troops and Russian forces that are now opposed to the government north of Moscow. Unfortunately, the Ultra-nationalist forces detonated a nuclear bomb during the battle. This act of terror causes the Ultra-nationalist regime to lose all legitimacy in the international community, prompting an immediate invasion of Moscow. After the Ghosts succeed in weakening the Russian fighting force, NATO forces launched an assault on Moscow, with the Ghosts spearheading the assault. By this time, the Ultra-nationalists have lost control of most of their territories, and the RDU was effectively dissolves. The remaining Ultra-nationalist forces holed up their tanks, snipers, Spetsnaz, helicopters, and artillery in the wooded areas surrounding Moscow as a last line of defense. However, the Ghosts break through the lines and clear a path for NATO forces. On November 10, NATO forces finally reach Moscow and are joined by friendly Russians. The city was partially deserted, as many Russians fled prior to the attack. The Ghosts were sent in to finish the job once and for all. After assisting NATO forces, the Ghosts attack Red Square. The Ghosts then proceed to wipe out the Russian defenders guarding the walls of the Kremlin. Without any remaining defenses, the Ultra-nationalists, led by Prime Minister Karpin, finally surrendered and both the Americans and the newly-liberated Russians celebrated their victory in Red Square. However, the world would feel the effects of the war for years to come. What will happen now? Russia will consolidate its hold over South Ossetia and will continue striked against Georgian military and possibly civil infrastructure throughout the night. (As said before, the bulk of Georgia’s military remain unmodernized third-generation Soviet stuff). It will basically be a repeat of NATO’s campaign against Serbia. Perhaps the Baku-Tbilisi-Ceyhan pipeline will be especially targeted. I expect military activities to cease within one to two weeks. Saakashvilli will be left isolated and impotent, too unreliable for co-operation with either the West or Russia, until a Russian-orchestrated coup shows him the door. EDIT4 (12PM GMT – 9 Aug): Saakashvilli insists on continuing digging his own grave, declaring war on Russia and fully legitimising the full spectrum of military measures at Russia’s disposal.